Very friendly staff and a clean room with 2 bedrooms and a kitchen. Perfect for our family! clean comfortable and quiet. What more to expect. Great hosts... great location. We highly recommend this rental, the hosts supplied coffee, condiments and everything you need to enjoy a beach vacation. Beautiful Penticton Condo for Canadian Snowbirds! Skaha Beach is within walking distance. Skaha beach by walking distance. 3 minute walk to Skaha beach, All you can eat buffet one block away. Skaha Beach is located in Penticton. Travelers love the area for its beautiful lakeside setting. Penticton is home to 200 hotels and other accommodations, so you can find something that's perfect for your stay. Best Western Inn At Penticton: With a stay at this 2.5-star hotel, guests can enjoy access to free breakfast and an outdoor pool, along with free WiFi. It's a favorite with Expedia travelers for its family-friendly amenities and clean, comfortable rooms. Valley Star Motel: This 2-star motel features an outdoor pool, free WiFi, and free parking. It's a favorite with Expedia travelers for its pool and helpful staff. Sunny Beach Motel: With a stay at this 2-star motel, guests can enjoy access to free parking and 4 outdoor tennis courts, along with free WiFi. It's a favorite with Expedia travelers for its beach locale and clean, quiet rooms. While you're in town visiting Skaha Beach, you can explore the sights within a few miles of the area. You'll want to browse the collections at Penticton Museum and Archives, Penticton Art Gallery, and S.S. Sicamous Inland Marine Museum. Sights like Peach and Munson's Mountain highlight some of the local culture. Get outside and spend some time strolling around Skaha Bluffs Provincial Park, Rotary Park, and Penticton Ikeda Japanese Garden. Okanagan Amusements and Cascades Casino are some sights worth a visit in the area. 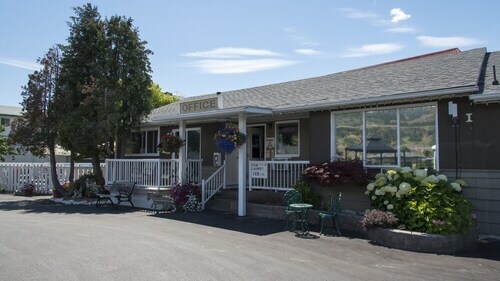 Spend some time checking out Penticton and Wine Country Visitor Center, which is 2.9 mi (4.7 km) from Skaha Beach, or make a stop by South Okanagan Events Centre, located 3 mi (4.8 km) away.